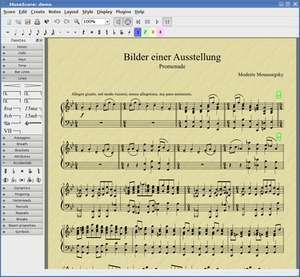 MuseScore is a musical score editor (sheet notes) which supports standard MIDI sequences. When creating a new document, a friendly step-by-step wizard will ask for data on the composition and the list of instruments to use, among other options. When you enter "N", MuseScore enters into the edit mode, giving you the opportunity to insert the notes from the side panels with simple drag and drop. To edit what you've created, exit edit mode first. Version 3.0.5 is a freeware program which does not have restrictions and it's free so it doesn't cost anything. For security reasons, you should also check out the MuseScore download at LO4D.com which includes virus and malware tests. Additional screenshots of this application download may be available, too. MuseScore has a presence on social networks. MuseScore download been highly rated by our users.